The Severn Road Bridge is the largest of the structures that now carry the M48 motorway over the Rivers Severn and Wye. 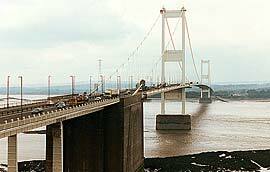 It was built originally to take the M4, which now runs over the Second Severn Crossing opened in 1996. A suspension bridge, this first Severn crossing features a pioneering arrangement of hangers set in a triangular pattern. The main span of the Severn Road Bridge is 987.6m long, suspended between two towers and flanked by side spans of 304.8m each. The roadway is 36.6m above the water and is carried on a 14.6m wide steel deck. The main cables are 500mm in diameter and are 22.9m apart, centre to centre. They each have a sag to span ratio of 1 in 12. The high tensile steel towers are 121.9m tall and 31.9m wide. They are constructed from 5.2m wide hollow box sections that taper from 2.9m to 3.7m thick, top to bottom. The transverse portals are also hollow box sections. The bases of the towers are fixed to the piers by prestressed and post-tensioned steel strands penetrating 15.2m into the concrete. The monolithic concrete piers supporting the towers are 40.2m long, 12.2m wide and 19.2m high. Aust (east) pier is founded on the Great Ulverstone limestone outcrop, while Beachley (west) pier is founded on two diameter concrete cylinders 18.3m in diameter and 10.1m deep sunk into the Keuper Marl mudstone. The side spans are anchored by approximately rectangular concrete blocks 47.2m long and 33.5m wide. The Beachley end of the bridge joins the Wye Viaduct. Work on the substructure began in March 1961 and was completed in March 1963, when work on the superstructure started. This first Severn crossing was opened by HM Queen Elizabeth II on the 8th September 1966, replacing the ferry from Aust Cliff to Beachley Peninsula. The bridge is designed to withstand winds of 161km/h (100mph). On completion it contained some 18,800 tonnes of steel and 96,300 cubic metres of concrete. The total cost was £7.9m. Bridge design criteria changed in Britain following the Merrison Report (September 1971) and this, together with increasing traffic volumes, prompted a full structural appraisal of the Severn Road Bridge. This showed that some parts of it did not comply with the required safety margins. Comprehensive works were undertaken between 1985 and 1991. The deck boxes were strengthened and the inclined hangars, which transfer loads from the deck to the main cables, replaced. Tubular steel columns were installed inside the towers to transfer one quarter of the load to the foundations. The steel deck was resurfaced with asphalt to distribute vehicle loading.